The Vitamin D sweater is off the needles just in time to bring a little sunshine into the late fall. This sweet little cardigan was knit using only three skeins of PathWays Sock Yarn (colorway Rumplestilskin). It’s a great sweater weight for tossing over a simple t-shirt and jeans for anything from a quick trip into town for groceries or to watch a movie. There were miles and miles of stockinette in this sweater but mindless knitting has a big place when we’re traveling from show to show like we’ve done for the past four weeks. 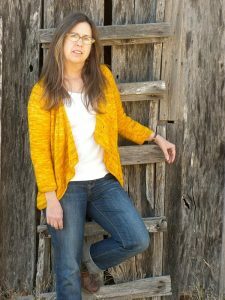 I knit a few rows in Arkansas at the War Eagle Fair, then I knit a few rows in Chicago at Vogue Knitting Live, a few more in Tulsa at the Garden Deva Open Studio Party, and suddenly in the Hill Country of Texas I was able to bind off a sweater the first day of Kid N Ewe and Llamas Too. That’s how it works. Since I was mighty smitten with the rich gold color of the yarn I decided to knit a pair of socks to coordinate with my Vitamin D. These are knit using the Primitive colorway. I used a bit of leftover Rumplestilskin for the heels, just for fun. My next sweater is already on the needles. I know in my last post I was excited about sweaters knit all in one piece but who can resist a Fiona Ellis cabled design? Not me. Several years ago I took Fiona’s Morphing Cables class and her explanations on reading complex cable charts have made me much more confident. 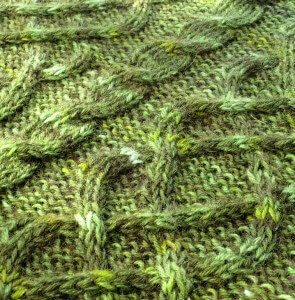 This the beginning of Fiona’s Gwendolyn (Twist Collective 2010), which I’m planning to knit as a cardigan with buttons. I’m about to begin decreasing for the armholes. The pattern includes directions for both a pullover and a cardi. The yarn is our High Country DK in colorway Extra Virgin. The subtleties of the non-solid yarn adds interest without distracting from the cables. Vitamin D looks fabulous! I love a nice rich gold colour. I always say I’m going to dye some for myself, but I never do. You totally could wear a deep gold! Fiona is a fabulous teacher! I am a HUGE fan of yours and now I have to monkey see, monkey do with that cabled vest! 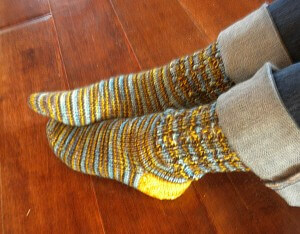 I love, love, love the colorway you are using. Oops, I mean cabled sweater….duh! It was all that hot cocoa I had last night!